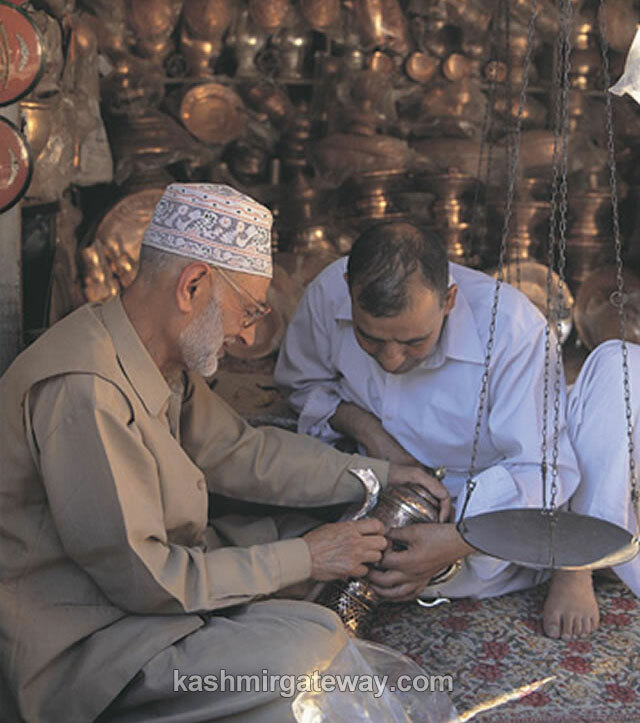 Kashmir is not only home to the vast cultural and ethnic diversity but also the myriad arts and crafts that have been carefully nurtured for the centuries. A variety of motifs, techniques and crafts flourished in the land as the people from different regions flocked through this beautiful place and many of the skilled craftsmen decided to settle amidst its charming abundance of natural beauty. 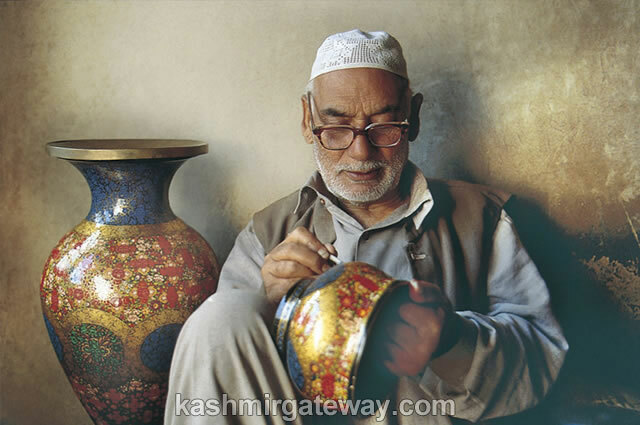 With time, these arts have gained even more distinctiveness and today Kashmir is known for woolen textiles, Pashmina shawls, embroidered suits, Kashmir silk saris, papier machie, woodcarving, hand knotted carpets and lots of other traditional crafts. 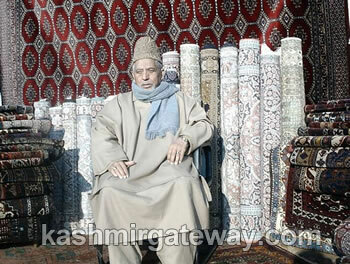 While in Kashmir please do visit our store, The largest carpet and handicraft store in North India. Carpets were probably first made by nomadic people to cover the earthen floor in their tents. It is not certain however, if the Egyptians, the Chinese, or even the Mayas first invented carpet making. It is quite possible that many people, none of whom were in contact with each other, began to make carpets at about the same time. The Persians were among the pioneer carpet weavers of the ancient civilization having achieved a superlative degree of perfection through centuries of creativity and ingenuity. From being simple articles of need, floor and entrance coverings to protect the nomadic tribesmen from the cold and damp, the increasing beauty of the carpets found them new owners-kings and noblemen, who looked upon them as signs of wealth, prestige and distinction. The history Kashmir carpet culmination of artistic magnificence –date back to the period of Hazrat Mir Syed Ali Hamdani (r.a.) 1341-1385 A.D. – the famous Sufi saint of Persia who came to enlighten Kashmir with his spiritual guidance and brought along highly skilled artisans through the silk trade route and laid base for the cottage industries in Kashmir valley. After the Mughal conquest Emperor Akbar 1580 A.D. also brought weavers from Persia to Kashmir . 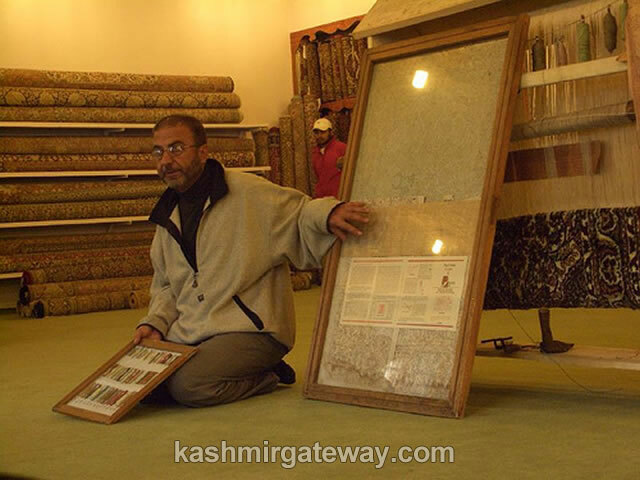 A great period in the history of carpets in Kashmir came In the time of Zainul-Abadin (Budshah) 1730 A.D. and our carpets started winning fame in far regions. The skill of carpet weaving has been handed over by fathers to their sons, who built upon those skills and in turn handed them down to their offspring as a closely guarded family secret. The Kashmir carpet, a piece of art par excellence representing the beauty of imagination, ingenuity and perfection amongst the highest level of art ever attained by mankind; is the finest and the most exquisite form of artistic expression. Kashmir carpets are works of art as s functional objects,. Indeed, many have reached such supreme heights of artistic expression that they have always been regarded in the world as objects of exceptional beauty and luxury in the same way as masterpieces of paintings .Kashmir Handmade carpets are discussed here in terms of their elements of design, material, technique, ornament and imagery use, and stylistic characteristics in different periods and cultures. Now the Kashmir carpet has reached its zenith. A Kashmir carpet is perhaps the most coveted of textile weavers, a passionate work of art, carefully chosen among the finest on earth and the elements of the design are like notes and melody or words in poem and are hundreds and thousands of hours of skilled work. Far less expensive are these colorful floor coverings made from woolen and cotton fiber, which has been manually pressed into shape. Prices vary with the percentage of wool – a Namda containing 80% wool being more expensive than one containing 20% wool. Chain stitch embroidery in woolen and cotton thread is worked on these rugs. Besides at least three different grades of Papier Mache, there are some cheaper versions in cardboard or wood available too. To make Papier Mache, first paper is soaked in water till it disintegrates. It is then pounded, mixed with an adhesive solution, shaped over moulds, and allowed to dry and set before being painted and varnished. Paper that has been pounded to pulp has the smoothest finish in the final product. The designs painted on objects of Papier Mache are brightly colored. They vary in artistry and the choices of colors. Gold is used on most objects, either as the only color, or as the highlight for certain motifs, and besides the finish of the product, it is the quality of the gold used which determines the price. Pure Gold leaf, which has the unmistakable luster, is far more expensive than bronze dust or gold poster paint but also has much longer life and will never fade or tarnish. Varnish, which is applied to the finished product, imparts a high gloss and smoothness, which increases with every coat. Cardboard, usually indistinguishable from Papier Mache, gives slightly when pressed firmly. 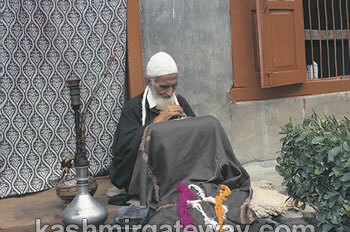 There are three fibers from which the Kashmiri shawls are made – Wool, Pashmina and Shahtoosh. Woolen shawls being are the cheapest while the Shahtoosh are the most expensive ones. Woolen shawls are popular because of the embroidery, worked on them, which is a specialty to Kashmir. Both embroidery and the type of wool used causes differences in price. Many kinds of embroidery are worked on shawls – ‘sozni’ or needlework is generally done in a panel along the sides of the shawl. Motifs, usually abstract designs or stylized paisleys and flowers are worked in one or two, occasionally three colors, all subdued. Another type of needle embroidery is popularly known as Papier Mache work because of the design and the style in which it is executed. This is done either in broad panels or either side of the breadth of a shawl, or covering the entire surface of a shawl. Ari or hook embroidery; motifs are well-known flower design finely worked in concentric rings of chain stitch. Pashmina shawls are unmistakably soft and its yarn is spun from the hair of the ibex found at 14,000 ft above the sea level. Although pure Pashmina is expensive, sometimes blending it with rabbit fur or with wool brings down the cost. Shahtoosh is the legendary ‘ring shawl’, renowned for its lightness, softness and warmth. The astronomical price it commands in the market is due to the scarcity of raw material. High in the plateaux of Tibet and the eastern part of Ladakh, at an altitude of above 5,000 meters, roam Pantholops Hodgosoni or Tibetan antelope. During grazing, a few strands of the downy hair from the throat are shed and it is these, which are painstakingly collected until there are enough for a shawl. Yarn is spun either from Shahtoosh alone, or with Pashmina to bring down the cost. In the case of pure Shahtoosh too, there are many qualities – the yarn can be spun so skillfully as to resemble a strand of silk. Not only are shawls made from such fine yarn extremely expensive, they can only be loosely woven and are too flimsy for embroidery to be done on them. Unlike woolen or Pashmina shawls, Shahtoosh is seldom dyed. Its natural color is mousy brown, and it is, at the most, sparsely embroidered. Shahtoosh is banned at the moment by the Govt. Chain stitch, be it in wool, silk or cotton, is done by hook rather than any needle. Because of the high quality of embroidery done on wall hangings and rugs, Kashmiri crewelwork is in great demand all over the world. All the embroidery is executed on white cotton fabric, pre-shrunk by the manufacturers. The intrinsic worth of each piece lies in the size of the stitches and the yarn used. Pampore, outside Srinagar, is the only place in the world besides Spain where saffron is grown. It is the most expensive spice in the world. Sealed jars of this Spice, with the Government laboratory’s stamp approval, are available all over Srinagar. The climate of Kashmir is ideal for walnut and almond trees, which grow here in abundance. Natural honey too, is a produce of the apiaries, which abound in the state. Tweed is woven in Kashmir with pure, never blended, wool. The resultant fabric competes favorably with the best fabric in the world. Sericulture is another important industry of the state. The cocoon reared in Kashmir is of the superior quality, yielding an extremely fine fiber, and any silk woven from this thread becomes known. The fineness of the yarn lends itself particularly well to the weaves known as ‘chinon’ and ‘crepe de chine’, in addition to the universally recognized silk weave. Interestingly, just as little or no raw material for tweed comes from Kashmir, almost no weaving and printing of silk is done in the state. This garment seems to be fusion of a coat and a cloak and is loose enough to admit the inevitable brazier of live coals, which is carried around in much the same way as a hot water bottle. Men’s pherans are always made of tweed or coarse wool while women’s pherans, somewhat more stylized, are most commonly made of raffel with splashes of ari or hook embroidery at the throat, cuffs and edges. The quality of embroidery and thickness of the raffel determines the price. 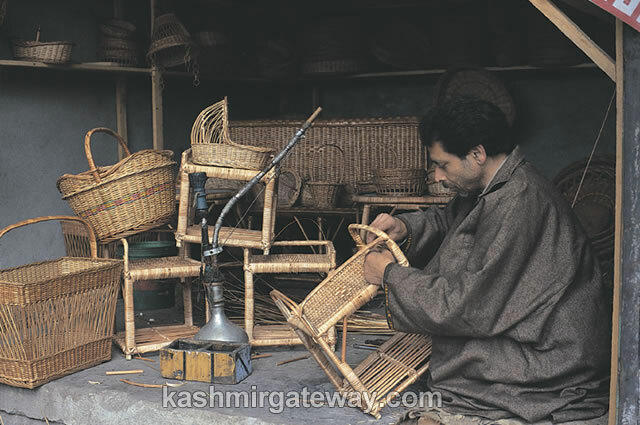 Willow rushes that grow profusely in marshes and lakes of Kashmir are used to make charmingly attractive objects such as shopping baskets, lampshades, tables and chairs and are generally inexpensive. To increase their life span, unvarnished products should be chiseled and frequently sprayed with water, particularly in hot, dry climates, to prevent them from being brittle. Kashmir is the only part of India where the walnut tree grows. Its color, grains and inherent sheen are unique and unmistakable, and the carving and fret work that is done on this wood is of a very superior quality. There are two types of walnut trees – the fruit bearing species whose wood is so well known, and one that bears no fruit and is locally known as ‘zangul’. Zangul has none of the beauty of walnut wood, being much less strong and possessing no grain while the walnut wood is almost black and its grains are much more pronounced than the wood of the trunk, which is lighter in color. The branches have the lightest color, being almost blonde and have no noticeable grain. The intrinsic worth of the wood from each part of the tree differs – that from the root being the most expensive and the branches having the lowest price. A cheaper product is liable to warp, or in case it is taken to warmer climes, will crack or shrink. Knots are usually concealed skillfully in the sawing, as it is difficult, though not impossible, to mask them while carving. Carving is the demonstration of the carver’s skill, and walnut is eminently suitable for this, being one of the strongest varieties of wood. There are several varieties of carving-deep carving usually with dragon or lotus flower motifs, two inches deep or more; shallow carving, half an inch deep done all over the flat surface; open or lattice work, usually depicting the Chinar motif; and most popularly, semi carving, which is a thin panel along the rim of a surface, with perhaps a Centre motif. The advantage of the semi-carving is that it allows the grain of wood to be displayed, together with the carver’s skill. Naturally deep carving with all the skill and labor required is the most expensive. Shops in local market of the old city abound with objects of copper lining the walls, the floor and even the ceiling. One can see craftsmen engraving objects of household utility like samovars, bowls, plates and trays. There are floral, stylized, geometric, leaf and even calligraphic motifs that are engraved or embossed on copper, and occasionally silver, to cover the entire surface with intricate designs which are then oxidized, the better to stand out from the background. The work known as ‘naqash’ determines the price of the object, as does the weight.